One day back in November I ordered a Berkshire pork loin roast (a little over two pounds) from the nice people at FreshDirect. I seemed to remember a previous such roast being a little dull, so I placed it the night before in my basic Thanksgiving turkey brine: salt, brown sugar, peppercorns, allspice, cloves, rosemary and thyme. And, you know, water. I realize that it would be helpful if I gave the proportions, at least the salt-to-water proportions. I think it was something less than a cup of salt in two quarts of water, but don’t hold me to that. In any case, it was probably slightly too much salt, although nobody complained. I brought the brine to a boil, let it cool, then stuck the pork in it overnight in the fridge. The next evening, I browned the pork on every side I could, with some butter, in a frying pan over medium-high heat. Then I set the frying pan aside and put the pork on a rack in a roasting pan in a 250-degree oven and left it there for a while. Maybe an hour-and-a-half? 4. For spaetzle: place a large pot of lightly salted water over high heat to bring to a boil. Place flour in a large bowl and season to taste with salt, pepper and a pinch of nutmeg. Add eggs, 1/2 cup cream and quark; mix well. When water boils, press dough through a spaetzle maker directly into water. As noodles float to top, remove with a slotted spoon and transfer to a bowl. Mix with a bit of olive oil. Set aside. The Dining section with this recipe had been sitting in our newspaper stack for a while, and I guess I had recently looked through it. I noticed that it called for quark, which before it became a subatomic particle was the German version of ricotta/cottage cheese, and sure enough they sell the stuff at Zabar’s. I didn’t notice the part about a "spaetzle maker" until I was already starting to mix the ingredients, so I improvised on that. I initially tried to mix with a whisk, which got me nowhere. So I switched to the beaters and that worked but was messy. 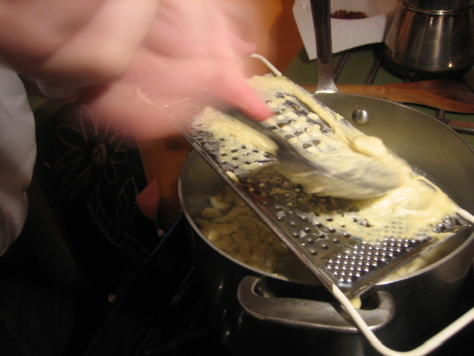 I then used a cheese grater to cut the dough into spätzle. It was a huge mess. I’d say maybe half the dough actually made it into the boiling water. But that half tasted really good. Part of what made it taste so good was a cream sauce, which I made like this: I looked at the pan in which I had browned the pork, and there didn’t seem to be quite enough pork residue in there. So I cooked some chopped-up bacon in it too. Then I took out the bacon bits, and poured out most of the grease. The accompaniments were a salad, which included those bacon bits, and a beet, grated and sauteed in butter, with a little lime zest and lime juice added at the very last second. (The recipe’s in The Gourmet Cookbook). Anyway, it all tasted really good. So good that I’ve been getting requests for the recipe, which I am only now getting around to posting. So after Christmas I made spätzle again, this time mixing the dough in the Cuisinart and using the spätzle maker. Sadly, I put the spätzle maker together wrong, and made another mess (see photo). The black rubber part is supposed to go on the bottom, not on the top. Since then I’ve been able to figure that out, and make lots and lots of spätzle. Also, I’ve used ricotta, which is a lot easier to find in stores other than the magical Zabar’s, instead of quark, and it seemed to work just fine.